Slurpy Noodles that are carbilicious, because I cannot live without carbs and they make you HAPPY not fat! Good carbs such as soba noodles, brown or wild rice, polenta, these are good for you! Please stop believing carbs will make you fat, they won't. Unless you eat industrialised crap. I love love love CREAMY foods. Be it salty or sweet, it is my weakness. So hummus is one of my most often go-tos, and there are so many kinds! from beetroot hummus, to turmeric hummus, to green pea hummus, to lentil hummus! YUMMERS. last, but most definitely not least, AVOCADO. Boy oh Boy do I love these healthy fats. Good for the heart, for the skin, for your blood pressure, for your cholesterol levels, and just deliciously creamy and rich. Do you love avocado as much as I do? I usually have at least half an avocado a day. Otherwise I feel like something is missing in my life. Ha. 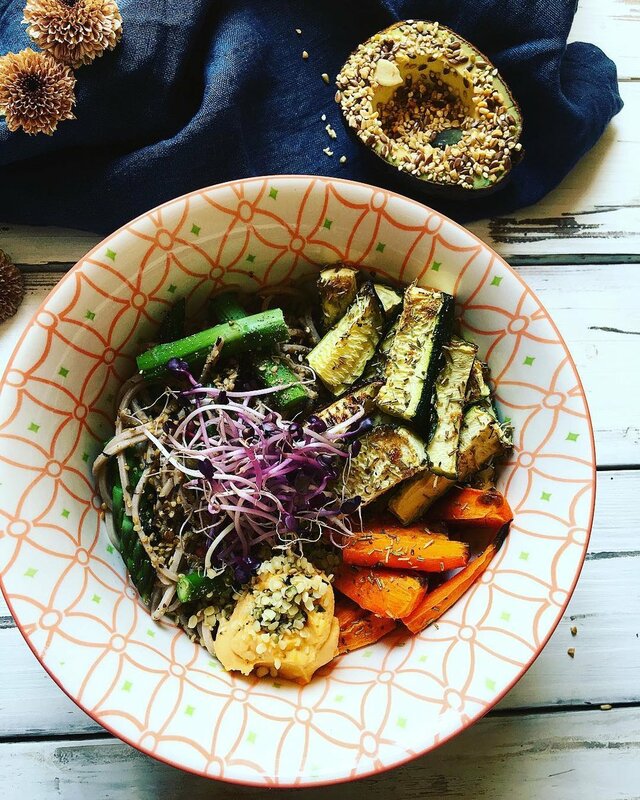 Here is the video for this Super energising bowl on my YouTube channel! Subscribe and stay up to date with all the new, fun, easy, healthy, YUMMY videos to come!